Located in some of the most desirable land in South-Central Alabama, Crenshaw County has an abundance to offer anyone looking for the perfect place to live, work and raise a family. Crenshaw County is blessed with rich farm land, timber, lakes, and a mild year-round climate. There are parks complete with tennis courts and jogging tracks, and most towns have a community center. Luverne Country Club offers its membership a nine-hole golf course, swimming pool and club house. Educational opportunities abound, including Primary/Secondary and Post-Secondary options. There are also excellent healthcare options. Crenshaw County epitomizes small town Southern America. The county is home to 13,906 people, and Luverne is the largest city with a modest population of 2,800. It’s a family-oriented area, with a wonderful sense of community. Companies moving into the area can be assured they will find a capable, experienced workforce to meet company needs today and tomorrow, while individuals know they will find a place they and their families can belong. Find out more about what Crenshaw County has to offer. Information about the cities and towns in Crenshaw County is available on the EDPA website. Follow the links below to access these reports. The Robert Trent Golf Course can be found in Greenville, Alabama, adjacent to Crenshaw County. Over 25 tons of peanuts are sold each Labor Day weekend at the Shriner’s World’s Largest Peanut Boil in Luverne, Alabama. People have been coming for 42 years to purchase the boiled peanuts and support the Shriner’s projects. Held annually in conjunction with the Boil, featuring arts and crafts, a 5K run, a car show and beauty pageant. 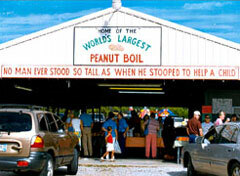 Read more about the Peanut Boil Festival on the Crenshaw County Chamber of Commerce’s website, www.peanutboilfestival.com. Annual banquet honoring an outstanding County citizen, sponsored by the Crenshaw County Chamber of Commerce. a beautiful multi-purpose facility at the Luverne United Methodist Church for hosting meetings, concerts, banquets, stage presentations, indoor sports. This center is also a Red Cross Certified Emergency Shelter for Crenshaw County. Located in Luverne, providing a full-service, 65-bed facility with 24-hour emergency care and many contributing surgeons and physicians, “where caring counts”. A premier nursing and rehab facility located in Luverne. Patients come from Crenshaw County and from many neighboring counties to experience a qualified, excellent staff. State approved Alzheimers Unit. A State approved, licensed, independent environment long-term residential facility. Sixteen private rooms, located on the golf course and adjacent to a lake, Lake Haven is secure and inviting.